Oh, good morning, and a very happy Friday to you! Today strikes me as good day to share a free hand embroidery design with you. And, with All Things Autumn sprouting up all over the place here in the States, it seems appropriate that it’s a fall-ish pattern! This is, yes, another kaleidoscope design. It didn’t quite make the cut for Favorite Kaleidoscopes, primarily because it is season-specific. I had planned on stitching it up for the website long before now and sharing the stitching process as fall progressed, but I haven’t had a chance to tackle it yet. Still – that doesn’t mean you can’t! How you approach them is up to you, but some stitching suggestions might include outlining the leaves in a variety of autumn colors, and working the acorns with satin stitch for the nut part and French knots for the caps. If you were really adventuresome, you could work the leaves in long and short stitch! And if you were Super Duper Adventuresome, some of those leaves would work well as stumpwork leaves. Oh dear. That might take a while! If you already happen to have Octoberfest! and the mini thread collection from House of Embroidery for that kaleidoscope, you have a good palette for stitching up this design. I wrote about the thread for that just this past Monday, and you can read about it here, along with information on a couple discounts on House of Embroidery threads for Needle ‘n Thread readers. Another excellent palette – and much more extensive – is the Autumn Collection from House of Embroidery. You can find it here. If you use the coupon code MARY2018, you’ll get 10% off, and if you’re in the States, you can apply the coupon code SHIPPING for free domestic shipping. The folks at Global Artisans will honor both coupons, even if you can’t enter them both when you check out. (Some people were having problems the other day with the checkout process and both codes.) If you have a problem, just drop them an email or leave a comment in your order form and ask for both codes to be applied. I know they were working on fixing that, but if it’s not fixed, you can still take advantage of both coupon codes. I’d use the MARY2018 code first, and then drop them a line about free shipping. That way, they know you’re coming from Needle ‘n Thread. The kaleidoscopes make great destashing projects, though, so if you already have a good collection of threads, you can always work straight from your stash! For those of us in North America, another excellent option for overdyed threads is Colour Complements out of Canada. #12, #35, and #37 in cotton floss will give you some nice autumn oranges, yellows, greens, and browns. If DMC is your stitching comfort zone, they also offer some good browns, greens, oranges, yellows, and reds in variegated threads. For those who might not like working with variegated or overdyed threads, no worries! Solid colors will work great, too! The point is, there’s absolute freedom here! Do you what you like, to produce the results you want with your finished project. 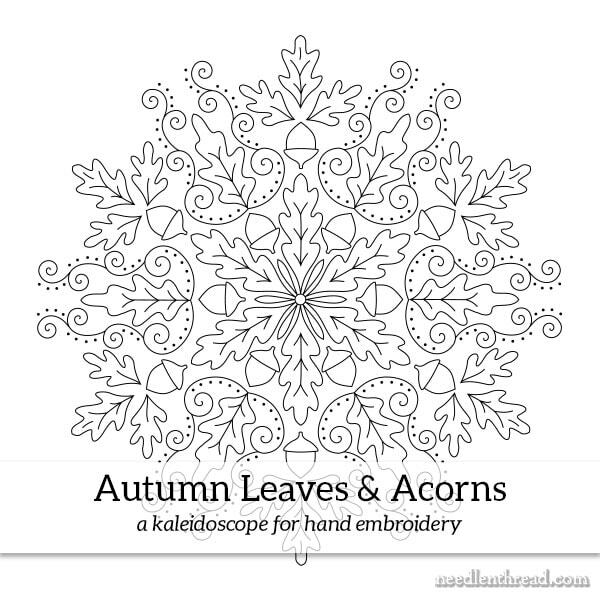 Here’s the PDF Printable for Autumn Leaves & Acorns. The design prints at about 6.5″ round, if you choose “no scaling” or “print original size” or something to that effect in your printer dialogue box. I hope you enjoy the pattern and that you have a perfectly jolly weekend! Mary…after reading all of your ideas for color choices and stitches, I opened the pdf file and I swear that I saw the pattern in greens, browns, oranges, reds, and embellished with tiny little beads! My imagination has this already stitched…it is just my hands that have not yet started! Thanks for sharing this pattern. Oh pretty! I may have to do this for a Fall wedding I anticipate next year – as a ring bearer’s pillow, all in ivory or white. I could also see doing two of these on either end of a table runner, and using something like your acorns and leaves border (with maybe some tweaks to the border leaves) along the edges. At that point I’d definitely do mostly outline stitches in the kaleidoscope. …I have too many things to get done for this Christmas, but that might work out well for my sister’s October anniversary for next year, if I remember it. Thank you Mary, this is fantastic and will work right in with my Princess of the Pond quilt as part of the ‘great oak woods’. My Hardwicke Manor fanny frame should be showing up any day now and I’ve also ordered the Dublin light that you recommend. My happy chair will be well occupied this winter. Hope your toes are a bit warmer today, have fun stitching. Thanks, Mary. I really love this design and look forward to trying it out. Mary, I was in the mountains of Pennsylvania one year and discovered a whole new selection of colors for autumn. I wrote descriptions to myself and discovered leaves could be pink, burgundy, purple, all shades of red, orange, & yellow, and yellow ocher. Lime green was in the mix too. There had been a snow shower so everything had a background of black and brown-black tree trunks (wet wood) and snow on green grass. Then a clear blue sky came out. It was breath-taking! Thought you might enjoy the ideas of extraordinary colors. Love this one! And my first thought was for the thread collection you mentioned. Definitely one to play around with. Thanks, Mary…hope you are gaining strength and feeling better and better! Hello Mary! What a lovely design! I’m curious: what software program do you use to create your designs? They are so lovely! I don’t use a software program to create my designs. I use a software program after the design is drawn, to turn it into a vector drawing (clean lines). For that, I usually use either Adobe Illustrator or Inkscape (which is the free ware version). A lovely Autumn pattern indeed. The options to embroider this is a lot. I am unable to decide the stitiches. I think of a few and lo! the other stitches look to be equally good. I am taking a while to decide on the stitches I guess. Thank you for sharing this lovely pattern. Hope to see your interpretation of stitches for this one as the season deepens its colours. Oh, this is super cute! Thanks, Mary. Mary, thanks for sharing this pattern and color advices. I sent mine on Pinterest. I tried aari crochet for it.